If you're unfamiliar with the game, it falls within the broad genre of "action platformer" where you assume the role of a member of law enforcement and have to take out all the bad guys in a level while also completing other objectives, such as rescuing hostages, defusing a bomb, or arresting a particular person. Clearing a stage is usually methodical; get as much information as you can about a room before entering, kick the door down, eliminate the enemies, proceed to the next one. Despite the methodical approach, the action itself is very quick. Most engagements last a few seconds with either you or the bad guys dead, and I've lost those gun battles more than once due to thinking I didn't need to reload my gun. There are 5 "worlds" with 12 stages per world. The objective for a stage is stated once you start it (there are also icons that indicate what to do before you pick a stage), and each stage is fixed, i.e., enemies will always be in the same rooms/places, room layouts are always the same, etc. That's an important aspect as part of playing this game is learning the "lay of the land." Your first time through you might be surprised by a shotgun enemy that spawns in behind you when you open a particular door, but you'll be prepared the next time. Once you've selected a stage, you can then select your class. There are a total of 5 different classes (Assaulter, Shield, Breacher, Recon, and Agent Fergie) that have their own gun and gear loadouts. Successfully completing levels will net you stars based on how well you do, and you can spend those stars to unlock new gear and weapons for the classes. Some gear and guns are shared across the classes, too, so if you unlock the Flashbang for the Breacher, it's also unlocked for Recon. In addition to the gun and gear unlocks, you'll earn experience points for your class (regardless if you finish a level or not) and level them up. One level gets you two skill points that can be spent to unlock new class-specific abilities and passive perks, like faster reload speed, enemies take longer to react when they spot you, or better melee damage, or on perks that apply to all classes, such as increased health. While these light progression mechanics give you a reason to keep playing, none of the levels feel like they're gated behind needing to be a certain level or needing certain gear. 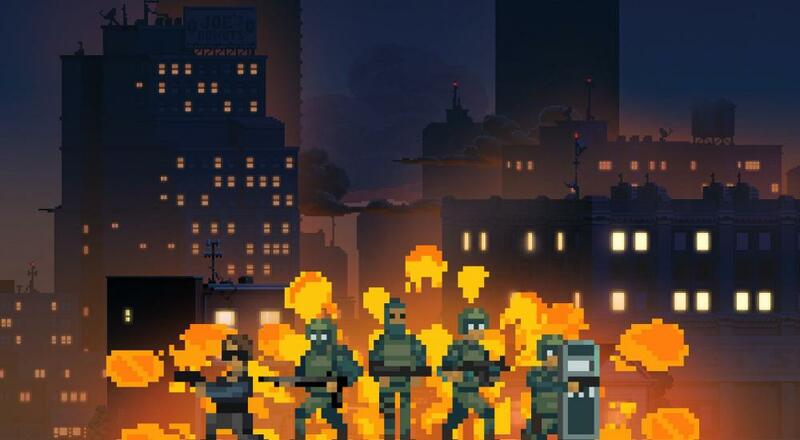 Mike said it a year ago when we played this game in its Early Access days, and he said it again when we played it a couple days ago: Door Kickers: Action Squad is a lot of fun in co-op. Single player? That's going to be more a matter of personal taste. Personally, I like with a buddy or going it alone. Both provide very different experiences that are both great. Door Kickers: Action Squad is available on PC via Steam for $14. Two player couch co-op or two player online co-op is supported throughout all worlds and stages.